Andrew: Hello readers! We are BACK after a relatively long hiatus, and we’re excited about this film we’re coming back from. Real quick though we want to apologize for the length of our absence from blogging. It’s just been a really busy last couple of months and our schedules have been so mixed up that it’s been difficult to A.) see a movie together, or B.) record, transcribe and post a review if we DID see a movie. But things are starting to get back to normal and we should be coming back with regular review posts as we get closer to the end of the year. We’ll also be posting reviews we’ve had in the can during our hiatus, so be on the lookout for those. 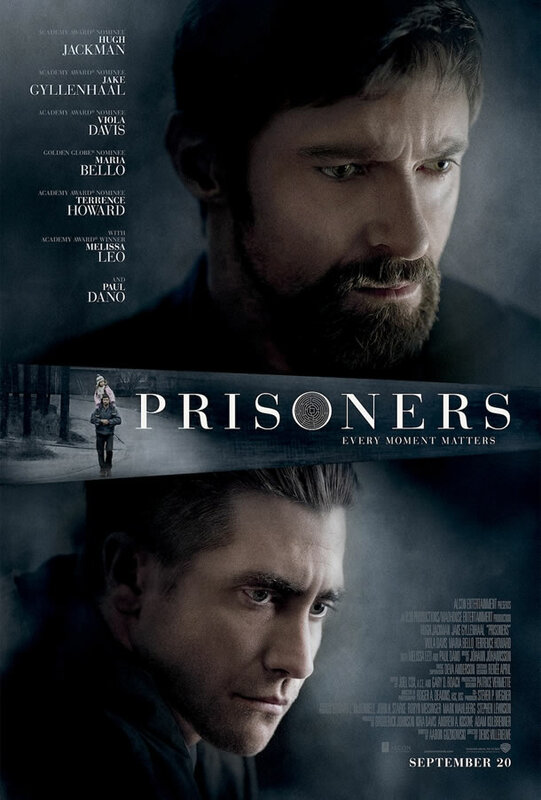 But the other night Sarah and I were able to catch a preview screening of this weekend’s new drama, Prisoners. It is the Hollywood debut of French-Canadian director Denis Villeneuve, who has already made a name for himself with foreign films like his Academy Award-nominated 2010 film Incendies. Sarah: And Paul Dano plays the prime suspect – a man with a low IQ that lives with his religious aunt, played by Oscar-winner Melissa Leo. It’s a fantastic cast! A: A star-studded cast for a film with a very dark subject matter, what with it being about two kids being kidnapped and the manhunt for them and their abductor. This is actually a film I’ve been looking forward to for a while, especially since the glowing reviews for it that came out of the Telluride Film Festival and the Toronto International Film Festival. What were your thoughts about Prisoners going in? S: I had seen the trailers and wasn’t super-stoked to see it, really, but when we got the tickets to see it for free I was like, “Awesome! I’m down for that, then.” I wasn’t expecting much from it simply because I didn’t know much other than what the trailers showed, but I don’t know WHY I wasn’t expecting much because it’s a STELLAR cast, including some younger actors showing off their chops and are getting me excited to see where their careers go. I wasn’t expecting it to be as stressful as it was, to be honest. It started out exactly like I expected it to because the trailer set it up perfectly. But it’s the raw…torture that this movie puts you through that’s just…agonizing to watch. It made me so very uncomfortable to sit in my seat and watch this story unfold. And it was painful to watch from every angle. I didn’t find there to be any comedic relief even though a few people in the audience laughed at some stuff. A: A mechanism to cope with the film, exactly. A: Yeah, this movie kind of puts you through the grinder. Again, it’s about two girls being abducted and it shows you the different sides of the fallout: how it affects the parents and in different ways, how it affects the detective involved, how does it affect the suspects? Because it goes in a number of directinos including some I never saw coming, and part of that is because it’s not really shown in any of the marketing! The trailer only really shows you a glimpse into the first 40 minutes of the movie or so. A: But again, you understand why, and it’s that grey area the movie keeps you in almost the entire time. S: And it’s that thing, the grey area, I couldn’t get out of it. I couldn’t root for anybody because nobody seemed to be moving! The whole film was kind of suspended in this grey area and it just rubs you raw. It’s like scratching that itch constantly and was unnerving to watch. It’s not an easy movie to watch. A: But…in my opinion, it’s a fantastic movie. S: It’s beautifully choreographed. As the film goes along the cinematography, the shots that it focuses on, feed right into the unnerving aspect of it just beautifully. I felt that the most unnerving shot, and I think you’ll agree with me, is a particular shot of Paul Dano when he’s being held captive where it focuses only on one of his eyes. It’s scary and it’s just a great shot. A: And this movie is FULL of great shots. I had read somewhere prior to seeing this that Roger Deakins was the cinematographer on Prisoners and I had thought, “Yes! That’s awesome!” but I had forgotten it by the time we actually saw it. Deakins, one of the best cinematographers in movie history, most recently did Skyfall, and I thought he got jobbed for the Oscar on that, but he did a phenomenal job on this film. There are an untold number of perfectly eerie yet beautiful shots, like one early on when the police and family members are searching in the woods for the girls at night. The shot is from above the trees and all you can see are the flashlight beams through the bare trees…it’s so eerie but gorgeous at the same time. A: It’s yet another aspect of the film that’s just nerve-wracking. S: Yes! It just rubs on your nerves, just the sound alone. They did well…as a crew, they knocked it out of the park with this film. A: We keep mentioning how Prisoners is nerve-wracking and rubs your nerves, and that also comes across in the performances, particularly from Jake Gyllenhaal and especially from Hugh Jackman. Jackman – the entire film – looks like a man who hasn’t slept in a week. A: Jackman’s eyes look so red and raw, like he’s been crying for hours on end, hasn’t slept in days and just has an anger deep inside him. It’s intense. A: You would never be able to tell me that Gyllenhaal doesn’t do that naturally. S: Well you would never be able to tell me that he hadn’t slept in ten days while filming this movie. A: When Jackman and Gyllenhaal are together, in the five or so scenes that they’re in together, it’s some of the best acting these two guys have done in their entire careers. Especially the scene in the car. Jackman in that scene? That’s totally Oscar reel stuff, but it doesn’t feel forced whatsoever. It’s so heartfelt that it’s scary but awe-inspiring at the same time. S: This whole movie is kind of Oscar bait, so let’s touch on that for a second. A: I wouldn’t say this movie is Oscar bait. S: Ok, but if Melissa Leo doesn’t get nominated for an Oscar for this I’m going to be blown away. A: I think she and Jackman especially deserve strong consideration, and I’d like to think Gyllenhaal might, too. S: What about Paul Dano? He had arguably the toughest role in the entire film and he’s an actor to continue to watch because he’s been doing amazing things and he’s just going to continue to do amazing things. A: This whole cast is great. And like you said earlier, everybody involved with making this movie knocked it out of the park. Fantastic directing by Villeneuve. A lot of the choices he made I absolutely loved. S: For it being his first Hollywood film it was very well done. A: Apparently he has another movie out not too shortly after this, also starring Jake Gyllenhaal, that I will definitely be checking out after this. And here’s maybe the best thing I can say about Prisoners: it’s a legitimate mystery film. S: It’s not a horror film, but it’s a thriller! A: I was on the edge of my seat the whole time wondering where it was going, wondering what was going to happen, and even when things started to click I was intrigued as to where it was going go. I will say there was ONE plot development that happens about a third of the way through the film and it seemed like a really important piece of info for Detective Loki, but he kind of forgets about it until it’s necessary for the plot to come together. A: Yeah, like, “When is this going to click with Loki? How is he missing this?” I’d say that’s maybe the one thing that bugged me, but even then I can look at it as the lead detective he just gets so consumed with all the other details of the case, having to deal with the suspect and the parents that it just gets pushed to the side in his head until the end. S: Yeah, I wasn’t ready for the end. Endings…I thought it was coming together and everything was starting to click for me, and then when the end happened I was still caught off guard. I wasn’t ready for that. Someone will take home an Oscar because of how this movie ends. You know, this movie reminds me a lot of David Fincher’s Se7en. A: Yeah, there are a lot of aspects here that felt like that. This movie is very Fincher-esque. S: Very Fincher-esque. Fincher I feel like he does raw movies on a whole ‘nother level, not many people can touch the level he makes his kinds of movies at, but this one felt a lot like it. Damn. S: This is a movie that’s going to stick with you. Like Se7en there will be images that stick with you well after you see the movie. They’ll haunt you. A: There are definitely a few shots from this film that I won’t let go because they’re so hauntingly beautiful. S: That’s okay, I didn’t need to sleep this week. It’s fine. A: It’s a fantastic movie, I’m so glad we saw this, and I’m glad we’re back to reviewing because this movie automatically shoots into my top five films of the year. It certainly lived up to the hype that was built coming out of those festivals. Completely agree with you on the performances of Jackman and Gyllenhal, impressive stuff! Paul Dano was excellent as well and brilliantly cast. Wasn't as taken by the ending as you though - felt it went a little bit too conventional for me although, that said, it did keep me on the edge of my seat! Not sure about awards season, have a feeling there are still some brilliant movies to come - 12 Years A Slave and Wolf Of Wall Street. Just saw Captain Phillips too - Tom Hanks is better than ever so really hope he gets an Academy nomination!